Winter is the ideal time to upgrade your patio, courtyard or backyard. Invest a little time now and you can have a fantastic outdoor entertaining space to enjoy come the warmer months. Today we reveal 5 exciting ways you can give your patio a makeover and ensure that your whole family will want to spend a lot more time outside next summer. Do you ever envy those friends who boast about eating outdoors every night in the summer time? 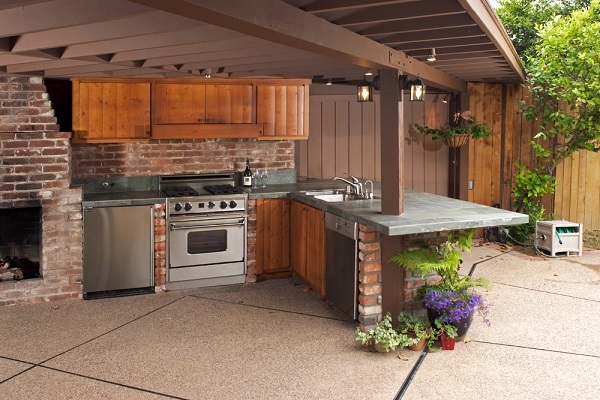 Having an outdoor kitchen may seem like a luxury you can’t afford. However, all you need to set one up is basically a gas grill. Then you just need to build an island around it and voilà, you’ve got an outdoor kitchen, meaning no more constant trips to the indoor kitchen while you’re entertaining outdoors. You can really go all out and add a bar, a fridge and even a wood fire oven; the sky is the limit. Exposed aggregate is an ideal surface to use for outdoor kitchens thanks to its incredibly durability and skid/slip resistance. If your outdoor space does not yet have a roof you can instantly enhance the comfort and utility of the area by providing a shelter element. From retractable patio roofing to building a free-standing trellis, there is a wide range of ways to create shelter for your outdoor entertaining zone. If you’re on a tight budget you might like to start with simply placing a few large sun umbrellas in a few spots on the patio. Even if you only have a very small patio to work with you can turn it into a charming space to retreat to when you or a household member needs to escape the everyday stresses for a few moments. Simply by investing in a small outdoor bench and pre-loved side table you can turn a mini patio into an outdoor oasis where you can come to have a brief coffee break, read a good book or reconnect with nature. One of the best ways to make your patio more stylish and attractive is to give it a natural feel that matches your garden, backyard or surrounding greenery. Textured concrete can be used to create a natural-looking patio surface that complements your landscaped garden or merely provides the ideal flooring upon which you can place plants, water features and other natural elements. If you have the issue of a bit of a steep slope from your garden to your patio (making the path from the patio to the garden a little uninviting) you could build a series of sturdy steps to connect the two spaces. Again, exposed aggregate concrete is a great surface solution as it offers great grip on steep slopes. If you are looking for exposed aggregate experts in Melbourne, look no further than A Better Driveway. We are highly experienced in exposed aggregate concrete solutions and can advise you on the best options to suit your needs and budget.